The university is a pioneer of problem-based learning and was one of the first Canadian institutions to open a teaching and learning centre. It’s official: McMaster University ranks as one of the top teaching universities in the world. The university in Hamilton, Ontario, is this year’s winner of the Global Teaching Excellence Award. The international prize is administered by Advance HE, a not-for-profit organization in the U.K. jointly owned by GuildHE and Universities UK, and is sponsored by Times Higher Education. This was the second year the award was handed out and McMaster stood out among 17 finalists from across the globe, including the University of Birmingham in the U.K., Spain’s University of Deusto, the University of Johannesburg and the University of Wollongong in Australia. Vancouver Island University was the only other Canadian institution to make the shortlist. Patrick Deane, president of McMaster University, accepts the award in Edinburgh, Scotland. Photo by Anna McKie/Twitter. The president notes that the win came largely due to the work of McMaster’s Paul R. MacPherson Institute for Leadership, Innovation and Excellence in Teaching, which started out as one of the first centres on a Canadian campus to focus specifically on the practice of teaching and learning. 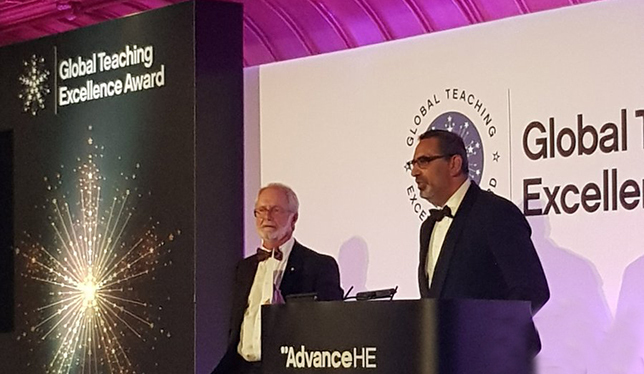 Dr. Deane and Arshad Ahmad, vice-provost of teaching and learning, accepted the award on behalf of the university at a ceremony in Edinburgh on July 18.